A grisly discovery is made at a farm near Cumnock in Ayrshire. So grisly that no-one involved in the case thinks they will ever be able to forget what they've seen. A young boy's mummified body is found buried in a barrel, and as the victim is removed, it becomes clear there is a second boy's body in the barrel with him. And so begins an investigation that has to face up to and peel back carefully hidden secrets from the mid-1980s, secrets that resonate down across the decades to the modern day. 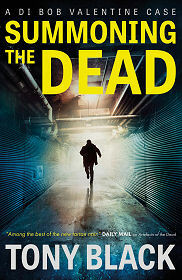 "Summoning the Dead" is Tony Black's third novel featuring Detective Inspector Bob Valentine. It is a highly engaging and entertainingly gritty read, and forms a very worthy addition to the series. Bob Valentine is a man who does not have his troubles to seek. He still suffers from the physical and emotional effects of an incident in which he was stabbed through the heart, needed 50 pints of blood, and declared clinically dead. His wife is insisting he puts in a transfer to a post in training, or anywhere that will see him move away from the constant danger of a repetition; and she is threatening to leave him if he doesn't. But resources are tight, and Bob's boss, Chief Superintendent Marion Martin, cannot manage without him where he is: however much she may try to undermine and overrule him on a daily basis. And if none of that were enough, Bob's near death - or more accurately, beyond death - experience has left him with baffling psychic episodes that he is finding he cannot come to terms with, yet which might actually help him get to the bottom of what seems a particularly intractable investigation. You'd think that by the time you get to an author's third novel featuring a particular protagonist, there would be a sense of easy comfort in reading the book, a little like slipping on a pair of well worn-in slippers. We suspect that Tony Black is never going to allow his readers that luxury. Bob Valentine's way of approaching the investigation, while at the same time trying to come to terms with all the other pressure he is under, give the book a delightfully edgy feel. There are elements in the plot which have been deployed by other storytellers in recent years, but Tony Black's take on historical child abuse gives the book a truly dark backdrop, against which other issues from the 1980s, such as continuing tensions resulting from the miners' strike in Ayrshire's ex-mining villages, can also be explored. Highly recommended.